Writer and painter Lydia Villanueva Arguilla (b. 1914) is known as the founder of one of the first galleries of modern art in the Philippines. A short story writer, her husband Manuel taught creative writing at a university and later managed the publications of the Bureau of Public Welfare. 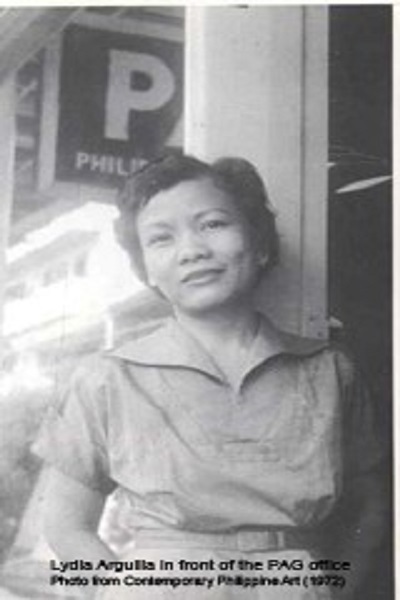 Lydia, who took up Journalism at University of the Philippines, worked as a copyreader and then as an editor, when she earned three times the income of her husband. The couple co-authored the book, Philippine Tales and Fables. When the war broke out, the Arguillas joined Marking’s Guerillas and formed an underground intelligence unit against the Japanese. Lydia began as a lieutenant and then became a major. She was also left a widow when Manuel was killed by the Kempeitai at Fort Santiago in October 1944. Lydia worked for the City Planning Commission at the end of the war. Later, a Roosevelt Leadership Grant enabled her to take up public relations and city planning, as well as creative writing courses, at Columbia University. When she came home, Lydia and other writer-friends—Estrella Alfon, Flora Lansang, Trinidad Tarosa Subido, and Consuelo Abaya—opened an advertising and promotions agency called Promotions, Incorporated. They hung modern paintings on the walls of their office. And so sometime in 1950, in Room 320 of Palomo building on Azcarraga Street in Manila, the Philippine Art Gallery (PAG) was born. We believe that if local art is to flourish, the support should come, not so much from others as from ourselves… We believe that art should be part of life and living, that the civilized person should go into an art gallery in the same way that he goes into a bookshop—to buy something he can take home, enjoy, and live with. The kind of art the PAG espoused was very different from the realistic, traditional art that was being done by Fernando Amorsolo and his followers. We will take a gamble on a painting executed primarily as a work of art, not as a commercial piece. We shall steer clear of nudes of no more artistic merit than to decorate a bachelor’s apartment. We shall not encourage landscapes of no deeper significance than to render photographic reproductions of surface nature. We shall avoid pseudoportraits created for the tourist trade. PAG held monthly exhibits of new paintings in the gallery and in extension shows. It also contributed to the systematization of collecting art by helping the artist catalogue his or her works and writing about the shows in newspapers. Among the artists who first exhibited at the PAG were Romeo V. Tabuena (who at that time worked in the art department of Promotions, Inc.), HR Ocampo, Nena Saguil, and Lydia herself, who took up painting “to be able to write about painting.” PAG also hosted art forums and lectures on issues such as modern art, the art of painting, and ceramics. Lydia has won awards from the AAP for her paintings and art criticism. In the 1960s, she organized several exhibitions of modern Philippine art in the United States, Southeast Asia, Europe, and Australia. Later married to the director and screenwriter, Pierre L. Salas, she served as cultural attaché and then vice-consul to Geneva until her death in 1969. CCP Encyclopedia of Philippine Art, Vol 4. Manila: Cultural Center of the Philippines, 1994. Duldulao, Manuel. Contemporary Philippine art: from the fifties to the seventies. Manila: Vera-Reyes, 1972.